What the Tipitaka seems to say. These things are not the same. Please keep this in mind while reading the articles, and please ask for clarification if you're unsure which of these is being talked about. I'm a bit burnt out on reading about political situations and interpretations at the moment. For the sake of my sanity I'm going to take a break from thinking about these things. So I'm going to do just that. I don't really like talking about kamma (Sanskrit: karma) because it's a difficult subject. It's extremely complex and having a truly proper understanding of it also requires a solid understanding of other concepts such as anatta (non-self, having no soul or permanent self) and anicca (impermanence). Therefore it's very difficult explain it both accurately and in a way that doesn't cause people to walk away with a completely false understanding of it. I personally don't feel like I can do a proper job of explaining it to people claiming to be Buddhist, much less non-Buddhists, and as you can imagine there seems to be a good bit of disagreement even among Buddhists on how kamma is suppose to work. The four most common misunderstandings are these. (2) We can never escape from the consequences of our past actions. If this were true then we would be completely determined by our past and be unable to change and attain enlightenment (A.I,249). The Buddha spoke of two types of determinism (niyativada); theistic determinism (issaranimmana hetu) which says that God knows and controls everything and thus has determined everything before it has happened and (2) kammic determinism (pubbekata hetu) which says that everything we experience, pleasant, painful or neutral, is due to our kamma, that is, how we have acted in the past. The Buddha said that both these ideas are not only false but also pernicious (A.I,173). Determinism means that the individual cannot choose one course of action over another, cannot make an effort to change anything and is not responsible for anything he or she does. Such a belief can only lead to irresponsibility and inactivity - ‘What can I do? It’s my past kamma.’ As the Buddha very correctly said, ‘If anyone were to say that we experience (the results of) a deed exactly as we have done it then it would be impossible to cultivate the spiritual life’ (A.I,248). In much of Buddhist Asia the widely held belief that everything is due to kamma is used as an excuse for peoples’ lack of social concern. This idea does seem to be disturbingly popular in Asia. I'm not sure if it's to be blamed on the influence of Taoism or maybe Hinduism (in East Asia I'd tend to assume Taoism, while Hinduism has had a good bit of influence in Southeast Asia) but it doesn't come from Buddhism. Unfortunately Buddhism suffers from reuse of the words kamma (Pali) and karma (Sanskrit) from other philosophies like Hinduism, but it's a difficult word to avoid because it's very fundamental to the language since it literally means action. Misunderstandings then arise because people who don't speak Pali or Sanskrit then think it's some magic opaque word that only refers to this philosophical idea and thus the idea must be the same across the board, but kamma and karma are in fact extremely generic words. This "excuse karma" problem especially disturbs me because it's constantly cited to me by non-Buddhists in the west as an example of why Buddhism is a bad influence and why Buddhist countries are in such bad shape. Unfortunately I don't know that there's much that westerners can do to change this sort of attitude in Asia. So what I want to know is, what are people in Asia, especially Buddhists, going to do about this attitude and improve the state of their countries? So karma/kamma is clearly not an excuse for inaction for anyone who is the least bit educated in Dhamma (Buddhist doctrine). The Buddha's refutations of doctrines of inaction are repeated constantly throughout the Pali Canon and are very consistent. This is the third installment (see Part 2) in a series of posts on DN 31: Sigalovada Sutta, The Buddha's Advice to Sigala the householder. Previously covered were the six ways of squandering wealth. Next the Buddha talks about the four enemies disguised as friends and the four good-hearted friends. No doubt some of these descriptions will remind you of people you've met or people you currently know. I'm not sure how much really needs to be said here. Everything is pretty self-explanatory. I guess things haven't changed much in 2,500 years as these kinds of people are still around! The meaning seems pretty obvious here as well. These are obviously people to be valued. Hopefully some of these people are still around after 2,500 years though honestly it doesn't seem like it a lot of the time. Clearly these people are not simply to be valued but to be treated the way a mother would treat her own child. People can't really get any more valuable than that. Here we find something that will confuse most modern western Buddhists. Why is the Buddha encouraging this householder to accumulate wealth? Isn't that greedy? Aren't laypeople supposed to strive for poverty because craving is caused by wealth? The answer is right there: "Once wealth is accumulated, Family and household life may follow." Wealth is needed for people to take care of their responsibilities. People who can take care of themselves, instead of expecting other people or the government to take care of their needs for them, are the ones capable of being true friends. The ones who dont't take care of themselves, due to lazynness and irresponsibility, tend to be the friends disguised as enemies talked about at the beginning of the sutta. To address the issue of craving, one should look at the sequence of dependent co-arising. According to SN 12.2 (for example): "From feeling as a requisite condition comes craving." So sorry, but wealth isn't in there. Wealth does not cause craving. "Attending improperly" to contact with senses brought on by wealth, which leads to feeling, causes craving, but the wealth by itself does not. The Buddha does say in other places that excessively wealthy people who are also virtuous are rare, which is why generosity is important. Someone with a talent for producing wealth is extremely valuable if they are also very generous, as Anathapindika was. Sadly I don't know of many western Anathapindikas these days. This is clearly saying that if you are responsible and taking care of yourself, rather than some excessively needy and constantly irresponsible person, then you're going to be able to be a good friend to others and you're likely to attract good friends as well. Irresponsible people don't save any money for hard times and don't pay their bills or work to invest in their livelihood whether that be a business or career, and these people are more likely to be poor friends. Really, if you are the least bit successful and devoted to non-greed then you shouldn't have much trouble saving a significant amount of your earnings for hard times rather than expecting others or the government to bail you out when you run into trouble. If you're not the least bit successful then you should try to get successful. It's also important to note that the "One part should be enjoyed" doesn't actually mean "all enjoyed by you alone" but also shared with your friends, employees, and "ascetics and Brahmans." This is stated in Narada Thera's translation in the note "This portion includes what is spent on good works: gifts to monks, charity, etc." So good friends not only take care of themselves, but share their good fortune with their friends, employees, and those deserving of charity regardless of whether they're Buddhist or not. 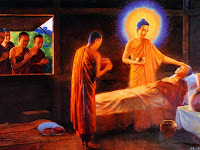 Another note about giving: Pretty much everywhere I have ever read the Buddha talk about giving, he never says "only give to me or my monks," he always talks about giving to "ascetics and Brahmans." If we think of monks as ascetics, and "Brahmans" as the more typical god-and-heaven-oriented religions, this means that there is no problem giving money to Christian organizations (for example). There's no requirement that you do so, but if you think a Christian organization is deserving then there's absolutely nothing wrong with donating to them and you are not discouraged from doing so in the least. Next in the sutta the Buddha finally gets to the symbolism of what Sigala was doing when he first encountered the Buddha, worshiping the six directions. This will be the subject of the next post. Different religions have different theories about the origins and nature of kinship. The Bible for example, says that all rulers derive their power from God and thus to obey the king is to obey God (Romans 13,1-2). In Europe this doctrine came to be known as ‘the divine right of kings’. The Buddha had an entirely different and more realistic concept of kings and kingship. In the Agganna Sutta he posited a social contract theory of monarchy. In ancient days, he said, people saw the need for some form of government and so they elected from amongst themselves a person who they thought would be best able to rule them. Thus according to the Buddhist theory, kings derived their legitimacy from general consent, i.e. from the people they ruled. It followed from this that a king retained his right to rule only for so long as his subjects benefited from it. Several stories in the Jataka implicitly suggest that people had a right to overthrow a king who was cruel, unjust or incompetent (Ja.I,326; III,513-14; VI,156). Such ideas were far too ahead of their time and there is little evidence that they were ever applied. However, the Buddha’s teaching of good governance had some influence in making kings more humane. Not to trash Europeans or anything, but it is kind of interesting how European countries tend to retain symbolic monarchies along with some symbolic version of the "divine right of kings." Perhaps this is mostly just a sort of clinging to tradition, but there are people in the west who still seem to believe in this "divine right of kings" idea. Essentially they deny that people ever have the "right" to revolt against their government, no matter what, even if democracy ceases to exist. This tends to come up most frequently in arguments regarding the US 2nd Amendment since this right is used as part of the justification for it. It's not clear that this is always an indication of siding with some sort of "divine right of kings" (or the general idea "subjects" exist for the sake of the government) or just the notion that there should be some non-violent way of revolting. Acquisition -- Wealth should not be acquired by exploitation, but through effort and intelligent action; it should be acquired in a morally sound way. Safekeeping -- Wealth should be saved and protected as an investment for the further development of livelihood and as an insurance against future adversity. When accumulated wealth exceeds these two needs, it may be used for creating social benefit by supporting community works. Use -- Wealth should be put to the following uses: (1) to support oneself and one's family; (2) to support the interests of fellowship and social harmony, such as in receiving guests, or in activities of one's friends or relatives; (3) to support good works, such as community welfare projects. Mental attitude -- Wealth should not become an obsession, a cause for worry and anxiety. It should rather be related to with an understanding of its true benefits and limitations, and dealt with in a way that leads to personal development. 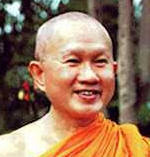 The teachings from a monk in Thailand are particularly interesting since Thailand was not subjected to the western colonialism that modified some of the thinking about Buddhism and economics in other Southeast Asian countries. Ven. Payutto's book is also refreshing because he doesn't try to advocate for a specific economic system (such as Socialism, Communism, Capitalism, Feudalism/Manorialism, etc.) but instead talks about the ethical issues surrounding economic decisions. I would highly recommend his book, especially to American Buddhists who probably haven't heard of any of the suttas that he mentions or quotes. What political activities should be considered permissible for monks?